What is the oldest idol of any Hindu God being found anywhere in the world? If possible provide some details about how much old it was. How did it look like? And what material was it made of? Please provide any image of the same if possible. As I discuss in this answer, the Shiva Purana relates a famous story about a contest that Brahma and Vishnu had, in which they raced to the top and bottom of a pillar of fire that Shiva had turned into. It's unclear when this contest took place; the Shiva Purana suggests that it happened close to the time of creation, but there's reason to believe that the account found in the Shiva Purana is a later interpolation. There are also claims that the story is old enough to be mentioned in the Brahmanas of the Rig Veda, but as I discuss in this question, I haven't been able to find such a mention. 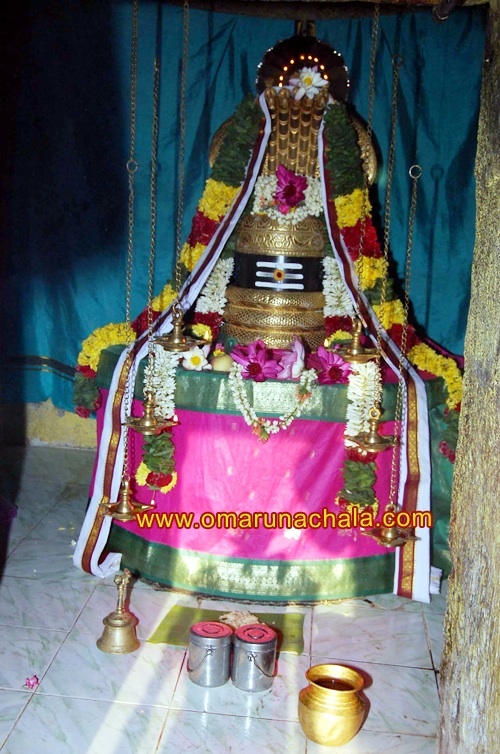 Note that this isn't the only occasion where Shiva appeared as a pillar of light; he appeared in 12 other places, the sites of the famous Jyotirlingas, for instance the Tryambakeshwara linga whose story I discuss in my answer here. You can see pictures of all 12 Jyotirlingas here, but I think those appearances of Shiva all happened after his appearance in Arunachala. Most people only know the story of Vishnu's incarnation as Varaha the boar up to the part where he defeats the demon Hiranyaksha and rescues the earth from the water. But as I discuss in this answer, afterwards he came down and started living on the Earth for the benefit of his devotees, and in fact Varaha is still alive to this day, on the western bank of the Swamipushkarini lake near Tirupati. 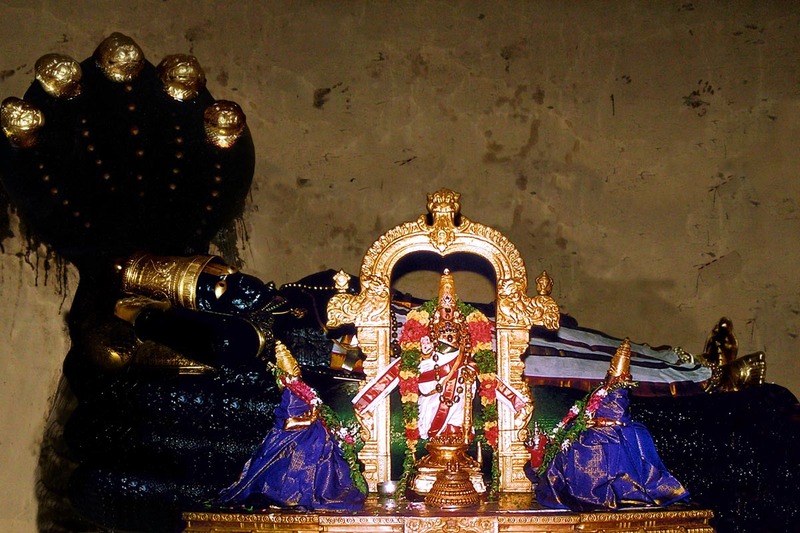 (In fact the original name of the Tirupati area is Adi Varaha Kshetra - the place of the first Varaha.) Devotees of the Tirumala Venkateshwara Temple in Tirupati, located on the southern bank of Swamipushkarini, are supposed to first worship Varaha in the western bank. Now Vishnu's incarnation as Varaha happened at the beginning of the Kalpa; in fact that is why the present Kalpa is called Shwetavaraha Kalpa, or the Kalpa of white Varaha. So this idol is certainly one of the oldest idols. Now we come to what I think is the real oldest idol in existence. Shortly after the birth of Brahma, which I discuss in this answer, Brahma started praying to Vishnu (perhaps with the hymn Purushagati, as I discuss here). As a result, Vishnu appeared before him and gave Brahma a divine statue of Vishnu lying down on the serpent Adiseshan. Much later, Surya the sun god began to worship it, and then Surya's grandson Ikshvaku had the statue brought to Ayodhya so that he could continue worship it. The statue was passed down through the kings of Ayodhya, until it came to the possession of Rama. Rama gave it to Ravana's brother Vibhishana, who planned to install it in Lanka. But on his journey from Ayodhya to Lanka, Vibhishana put the statue down in the island of Sri Rangam in the middle of the Kaveri river, so that he could bathe in the holy Kaveri. When he came back, he found that he could not pick up the statue with all his might - Vishnu wanted to stay in Sri Rangam. Considering that it was worshipped by Brahma from the time he was born, Ranganatha is probably the oldest statue on Earth. Some of the oldest have been found at three archaeological sites called Mohenjo-Daro, Harappa, and Chanhu-Daro (about 2-3,000 B.C.). Items found are mostly of stone, a little of metal. Anything made of anything else (like wood) decayed long ago. 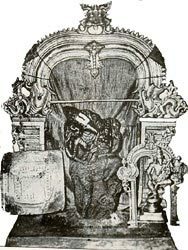 Some of the items included a phallus, indicative of Shiva worship; a goddess with a lotus in her hair, probably Lakshmi; a deity seated in a lotus position, etc. The book that I have, Myth and Symbols in Indian Art and Civilization by Heinrich Zimmer, has many plates with pictures. You can Google the three city names above for more information and pictures. The oldest Hindu image (if at that time, any kind of Hindu religion, as we know it existed ??) idol, statue or figurine that has stood the wear and tear of time to survive until the 21st century is the small 41 gms bronze-like alloy figurine of (Shiva or Vishnu - ?? we are not sure which). The idol is over 28,000 years old. The small metal figurine, also called "KALPA VIGRAHA" and was the subject of a lot of controversy for over 50 years. World leaders and many celebrities were known to have got involved in the experiments that followed the find in the 1950s. The story begins when the Kalpa Vigraha was seized by the CIA from Nepal or Tibet in the 1950s from a Buddhist monk (in an old wooden box) who was later killed by the invading Communist Chinese. The CIA found an old manuscript in the same wooden box, written on a number of wooden strips in a language that was older and preceded the Sanskrit language. Two years were spent on trying to translate the manuscript. Carbon dating of the manuscript at the California laboratory showed it was more than 28,000 years old. The awe-struck CIA officials then finally deciphered the manuscript and the instructions contained in it. For example they found out that the name of the idol was "Kalpa maha ayusham rasayana Vigraha." Word-for-word it translates as "Idol of great-age-life-endowing-elixir". Further instructions contained how the idol was to be activated, utilized and worshipped. The CIA ignored the "worshipping" and concentrated on the other instructions. They conducted a secret experiment on US citizens to test the veracity of the claims on the manuscript. This involved feeding water in which the Kalpa Vigraha figurine had been immersed for 9 days. Unsuspecting people were fed this water for three consecutive days. Then all of a sudden the experiment was wound up, but the human-beings (hundreds of them -some even outside the US) were "tagged" and a "watch" was kept on them for decades following the experiment. Now, this is the most startling part of the story:- Sometime in 2006, some retired CIA agents suddenly or inadvertently revealed the story of the experiments they had conducted in the 1950s to some well known journalists. Only then did the outcome of the watering experiments became apparent. Almost all the unsuspecting recipients of the water (in the 1950s) were still alive, some well beyond 100 years old. As late as 2006 in the 21st century the CIA realized the meaning of "Idol of great-age-life-endowing-elixir". But now confusion reigns in the CIA departments as the idol is suspected to be missing. It was stolen by a deeply religious Telugu IT professional, smuggled out of the US, and is believed to be somewhere in Andhra Pradesh among the many gods he worships in his family Puja room. Images of the Kalpa Vigraha, which were circulated by the CIA, can be seen on the internet. Not the answer you're looking for? Browse other questions tagged temple history idols .